I know some of you reading this will have made hundreds of baked potatoes in your lives, and will already be completely happy with you potato technique. If that’s the case, congratulations! And feel free to skip this one. But judging by the popularity of my ‘how to make perfect roast potatoes‘ post (which is somehow one of the most popular posts on this blog! 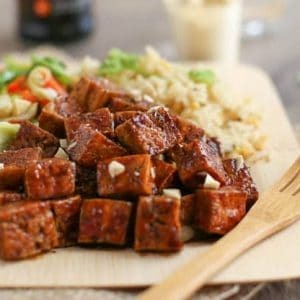 ), I also know that you might be quite new to cooking for yourself. Or, maybe you’ve just never ventured into the world of baked potatoes before (you’re going to love it). Or maybe you’re just nosey and you want to see how I make mine. In which case, hello fellow nosey person! Read on. In the UK, we call baked potatoes ‘jacket potatoes’ because they’re soft and fluffy in the middle, with a crispy jacket surrounding them. It’s one of the more adorable food terms we have, and possibly the one that makes most sense (it certainly beats ‘toad in the hole‘, anyway). I really do think that baked potatoes are underrated – they’re not exactly haute cuisine, but they make a brilliant easy dinner, either served alongside something else, or on their own with some kind of topping. My personal favourite is butter and cheddar cheese – when something is so perfect, why complicate it? 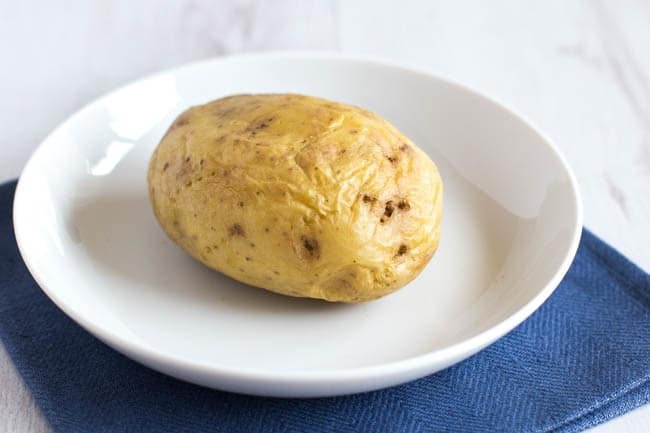 I feel I should add a little disclaimer here (I know you guys are all lovely, but you’d be surprised how many people enjoy complaining on the Internet) – this is just one way to make a baked potato. If you use a different method, great! But personally I think my way of making a baked potato is the perfect way to get a fluffy middle and a crispy skin. Yum. In the UK, bags of potatoes often tell you what they’re best for – great for mashing, roasting, baking, etc. If you’re not lucky enough to have things spelled out for you quite this clearly, try Maris Pipers, King Edwards, Yukon Golds, or Rooster potatoes. You can find out lots more about different potato varieties here! Choose quite a large potato for optimum baked potato-ness, and remove any eyes or sprouts. 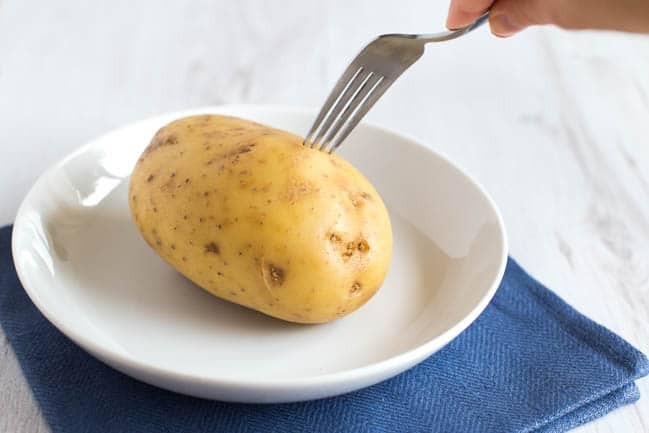 Piercing the potato’s skin with a fork will stop it from splitting when it cooks. You don’t need to pierce it deeply – just a few times all over is fine. Part-cooking in the microwave is my baked potato’s dirty little secret. 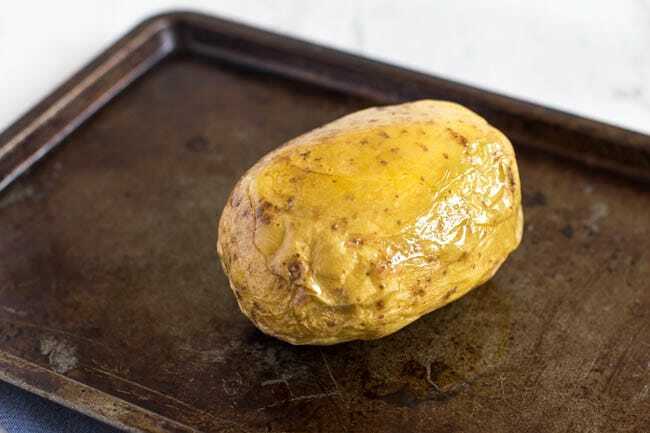 You can just put your raw potato straight into the oven if you like, but they can take ages to bake – sometimes a good hour or more – and ain’t nobody got time for that. 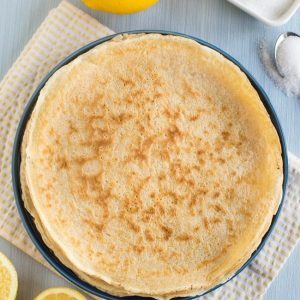 Plus, I’ve found that pre-cooking them in the microwave helps to give a really soft and fluffy middle, without ending up with a really hard and thick skin. 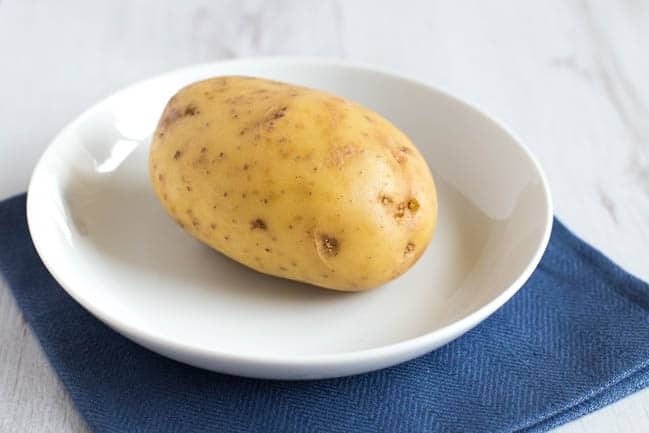 Cook the potato in the microwave for around 6-10 minutes (depending on the size of your potato), or until the centre is almost entirely soft (poke it with a fork or sharp knife to test it). Turn the potato over halfway to ensure even cooking. When it’s ready, the skin should be just starting to wrinkle. 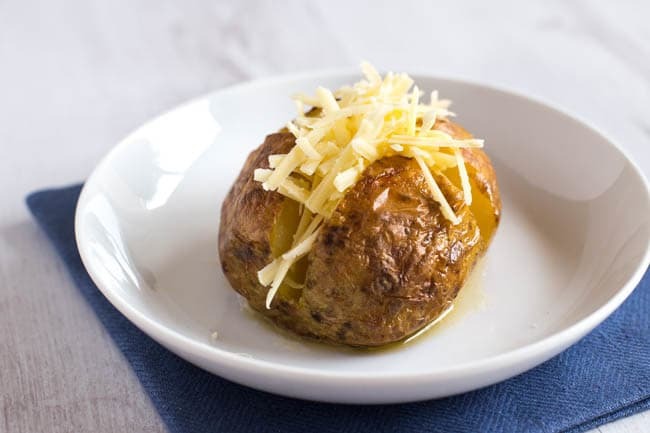 I never used to oil my jacket potatoes, but it makes such a difference to getting a super crispy skin, and will make your baked potato taste amazing too. Just drizzle over a tiny amount of oil, and rub it all over the skin of the potato. You can also add a little sprinkle of salt at this stage too. Finally, you can actually bake your baked potato. 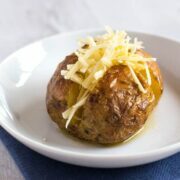 Since the potato is already mostly cooked, you can bake it for as long as you like really – anything from ten minutes to half an hour – to get the skin to your desired crispiness. And then it’s just time to add your toppings! 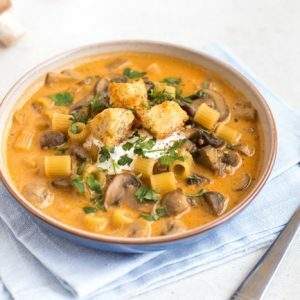 As you can probably tell from the abundance of cheese recipes on this site, I’m partial to a bit of grated cheddar (and potentially a little heavy handed with it too…), but the options are endless. Baked beans, sweetcorn, and coleslaw are some of my favourites – feel free to leave your ideas in the comments! So there you have it – how to make a perfect baked potato, Becca-style. What’s your favourite technique? Thoroughly wash the potato, and remove any eyes or sprouts. Prick a few times all over with a fork. 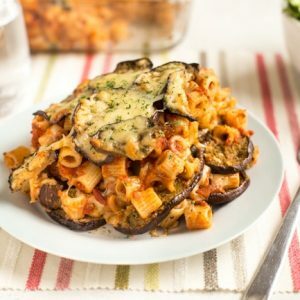 Place on a microwave-safe plate, and cook in the microwave for around 6-10 minutes (depending on the size of the potato), until the centre is almost entirely cooked and the skin is just starting to wrinkle. Turn over halfway through cooking. Drizzle the potato lightly with oil, and rub it all over the skin. Bake the potato until the skin has reached your desired level of crispiness - anywhere from 10 to 30 minutes. Note: Nutritional information is approximate, and will depend on exactly what ingredients you choose. Information above is for 1 large potato baked with oil, not including toppings. If you’re a potato lover like me, don’t miss my perfect roast potatoes either! A few comments learned from baking potatoes for over 40 years, and working in restaurants. Baking them on a bed of salt (rock salt works best & you can reuse it) helps to pull the moisture out of the potatoes, as does poking them with a fork. This helps to make a fluffy baked potato. I always oil (or butter) the skin before baking and usually sprinkle kosher salt on the outside also before baking. I was trained once by a good chef that you should cut off a bit of the ends of the potatoes (1/4 inch), which will also let the moisture out and make a very fluffy baker. I don’t do this as much anymore since the finished product looks a bit strange, but it does work. I’ve been microwaving them before baking since I got my first microwave years ago, as it really cuts down on the time baking. Here in the States the best potatoes to use for baking are the thick skinned Idaho Russet, which makes a great edible skin when baked. Last but not least, NEVER put foil on a baked potato, during or after baking. This will cause any moisture still in the potato to soften the skin and you will be missing the best part of the baker. I started cooking my potatoes exactly like you do. Gee, I thought I was the only one lol .. Yes! The microwave makes a noticeable difference in the potato.. almost like a mashed in the center. So smooth and such a pleasant surprise. I also oil and salt my potatoes. I salt all the way around them with Kosher salt. Sp dood! Watching the picture of the butter melting made me laugh. I smother my potatoes with butter. I also like cheddar cheese on mine… and sour cream! Not all of the time, but occasionally .. and if I have it on hand. I also had the contraption Annabel mentioned. Mine broke after so much use. They do cut the bake time down. Here they also sell long aluminum nail to stick into them. I don’t know what happened to most of them. Lost in the drawer somewhere. But, all in all, I agree with you. Baking the ‘Jacket’ Potatoes this way is the way to go! Glad you agree with my method! :) Don’t think I’ve ever had sour cream on a baked potato but it sounds great. Never. Had. Sour. Cream. On. Baked. Potatoes? Omgoodness i never have baked potatoes WITHOUT sour cream. Run to the shops right now and get some! Haha! Maybe it’s an American thing? In the UK it’s usually butter! I have never tried microwaving my potatoes before baking. Clever! And I love the idea of drizzling olive oil…. Crispy skin….YUMMM! These are great tips. Great post! I often microwave my potatoes before baking – but I really like the oil that you add before baking. Delicious and a welcome treat on a cold night. Thanks! I always scratch my head when I see which recipes are the most popular on my site too…they’re always the ones completely out of left field! 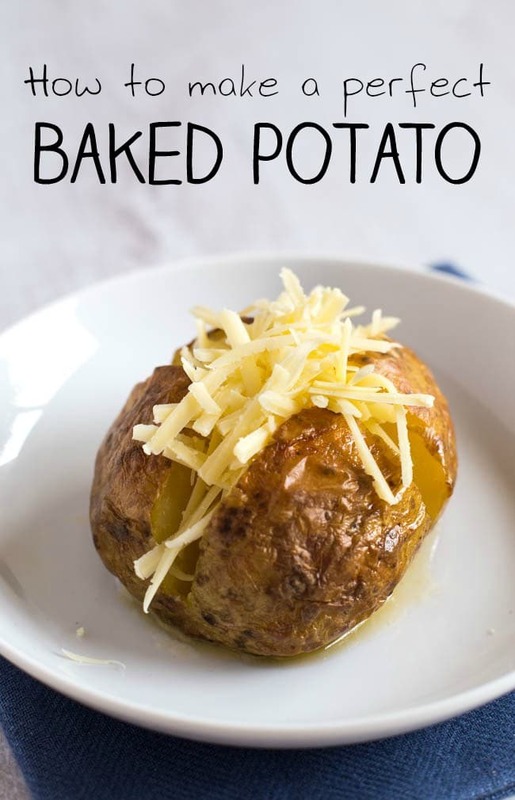 But…as a fellow baked potato lover…I’m quite excited to try this method out and judging by its popularity, I bet it’ll be a winner! 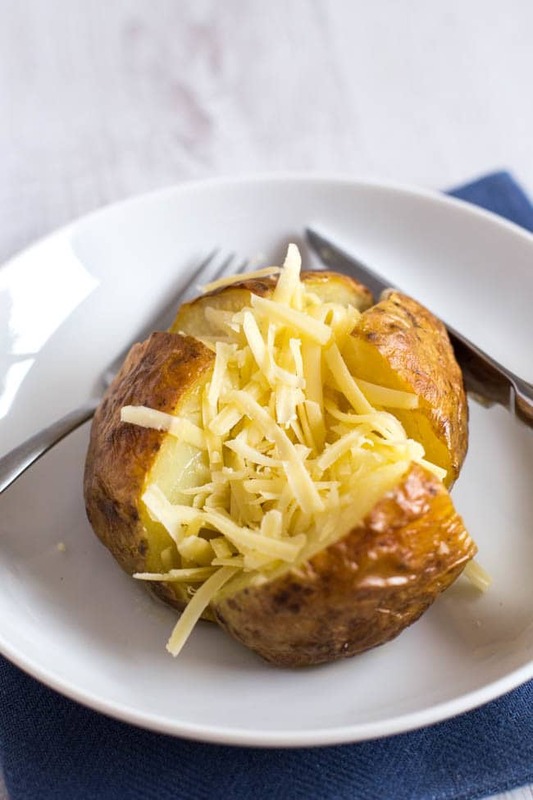 There’s really nothing better than a crispy skinned baked (jacket) potato! I love your method of pre-cooking in the microwave…brilliant in its simplicity! I never tried microwaving and then baking. I must try it. I would salt them after oiling. My favorite steak house does that and they are sooooo yummy. Love baked potatoes even though I dont have them often. 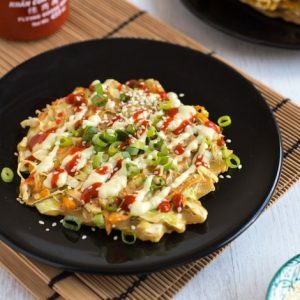 When I do, a delicious variation is a mexican potatoe. No butter but some shredded cheese melted on top then I add some of the fresh salsa(in the states I get it in the produce aisle) and sour cream. 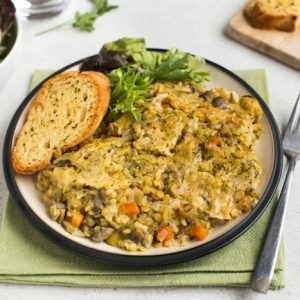 It is delicious and can be a meal it is so filling! Oh wow that’s a great idea to microwave first and then finish off in the oven. This has made me fancy a jacket with cheese sooo much! yum. 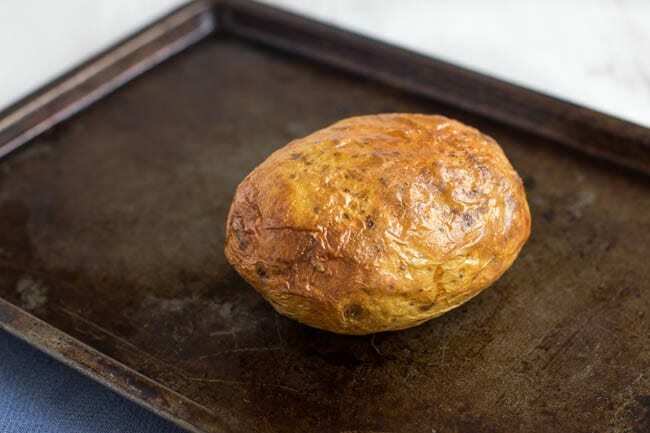 Love your way of doing a jacket potato, I follow the Nigel Slater method and put some sea salt onto a baking tray, place the potato on the salt and bake for 1 & 1/2 hours at 200 degrees for super crisp skin! You can’t beat strong cheddar but I also love it with sour cream & chives! Ooh I’ve never tried a salt baked potato! Can you reuse the salt over and over so as not to waste it? I do mine pretty much like you but also rub in salt with the oil and I do a cross on the top and the bottom of the tattie rather than prick. Going to try pricking next time! I bet the cross functions in much the same way! One of the best toppings is egg salad. 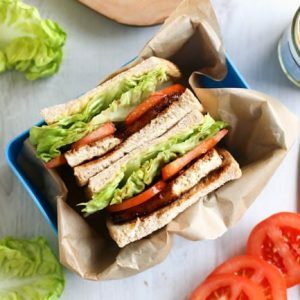 You know, the stuff you put in an egg and lettuce sandwich. Trust me, it’s delicious. We used to have a small chain of jacket potato shops in my part of south London – now, alas, sadly demised. One of our favourite fillings was what was called “egg and cheese” but was in fact egg mayonnaise with grated cheese and a little onion in there. It was one of the first meals our daughter used to cook for us. That sounds strangely good, I really need to try this egg thing! Another thing you can do to speed up cooking time is to poke a metal skewer through them – you can buy them specially for potatoes, I believe. Years ago, back in the days before microwaves (and yes, I am that old), one of my grandmothers gave me a special gadget that you could sit four potatoes on, like some gruesome implement of torture, and that, too, reduced the cooking time by over half. Oh, here is the gadget I mean. Someone mentioned the skewer trick on Facebook too! I’ve never heard it before, must try that! Never knew these were called jacket potatoes in England – makes sense though! Love that you baked these in the end — will have to try this! I usually go the quick microwave route, but with only a few mins in hte oven I bet it makes a world of difference! I do mine like this on pizza nights, they only get the same time as the pizza in the oven! I like to top mine with coleslaw, but it has to be deli style or the proper stuff, none of your reduced fat, which tastes nasty when put on the spud. Otherwise, beans and cheeese. Pizza served with a jacket potato, I like your style! ;) Definitely agree with getting decent coleslaw, the cheap / low fat stuff is horrible. Great how-to. I always struggle with making baked potatoes. I either overcook them or undercook them. You never would’ve thought that making a baked potato could be so difficult and yet, something always goes awry!! This was definitely a handy read! I love baked potatoes. I hadn’t thought of part-baking them in the microwave first though. I’ve always believed that potatoes shouldn’t be put in the microwave but I suppose to start them off in one to cut down on the cooking time isn’t a bad idea! It really does cut down on the cooking time and avoids that horrible thick, hard skin that baked potatoes can sometimes have. I don’t think I’d ever cook potatoes entirely in the microwave, but part-cooking them in it works really well! I make them exactly like these. Lots of olive oil and salt add that great flavour. This is how I’ve always done it , double cooking potatoes – once in the microwave and then crisping them in the oven. But I’ve always done them as strips – like fries. Never done an entire potato. I made jacket potatoes at home from scratch before but I don’t own a microwave so I would boil them for at least 30 minutes before putting them in oven to bake. They still take ages before they are ready though! I read somewhere that coating them with oil and salt is the key to make them crispy on the outside.